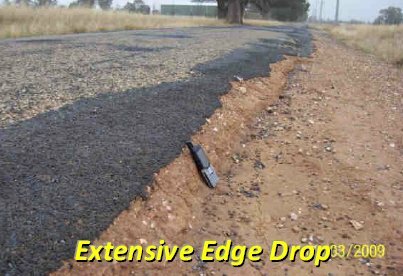 An edge drop-off is road geometry defect where the vertical distance from the edge of seal to the adjacent shoulder exceeds acceptable limits. 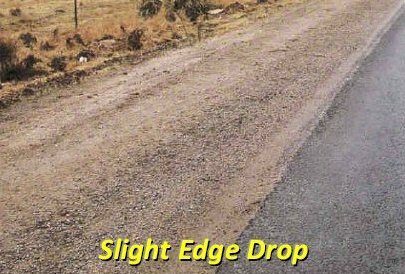 Edge drop-offs generally occur when the road shoulder is worn, or there is inadequate strength of the pavement ay the edge of the roadway. 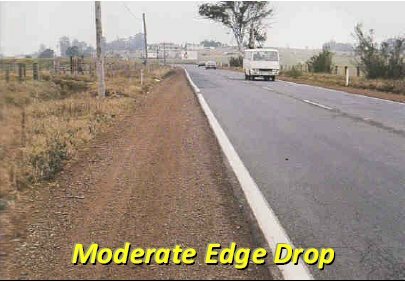 A significant edge drop-off can make the transition between the road and its shoulder challenging particularly for smaller vehicles, and this may result in a loss of control for the vehicle. A pavement defect where the vertical distance from the surface at the edge of seal to the surface of the shoulder exceeds acceptable limits. (e.g. 10-15mm) - Glossary of Austroads Terms.